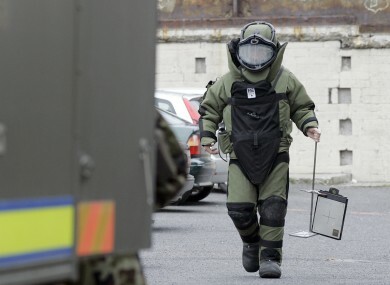 TWO MEN ARE still in garda custody after being arrested when a large cache of explosive material was uncovered in Louth. An Army bomb disposal team spent six and a half hours making the explosives safe on Saturday on the farm near Hackballscross. A defence forces spokesperson said that components of an improvised mortar system, as well as a large quantity of fertiliser, were found at the scene. According to the Irish Independent, the farm was a bomb-making factory believed to have been manufacturing weapons for the Oglaigh na hEireann republican movement. The explosives could have been used in a series of mortar attacks in the North, or one large bomb attack. It’s not known whether the find was linked to the large device which was found in a van on the M1 motorway in April. The Defence Forces were called in after the farm was targeted as part of an operation targeting dissident republican activities. The men, who are both in their fifties, are still being questioned at Balbriggan and Drogheda garda stations. They were taken into custody on Saturday during armed searches at the farm, the Guardian reports. Email “Two men still being questioned over large explosives find”. Feedback on “Two men still being questioned over large explosives find”.